Her shelter name was Kenzie. She was a four-month-old, 14-pound black ball of fur giving all the bigger dogs in the yard at the Second Chance shelter in Plano, Texas, a good workout when I first saw her. 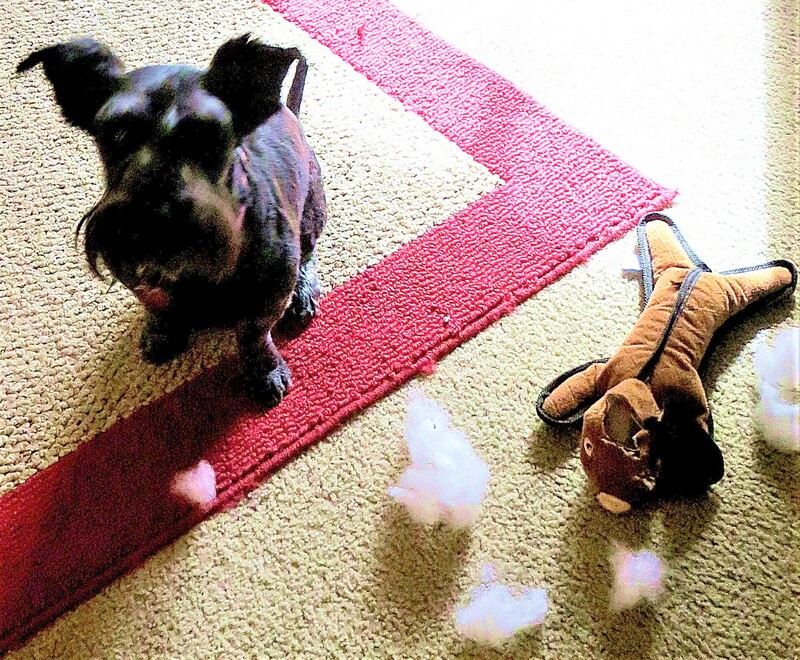 She was full of energy and joy and not the kind of dog I was looking for to replace my long-time canine companion Maggie. I wanted a two or three-year-old dog, preferably a cocker spaniel mix, who was already house trained. 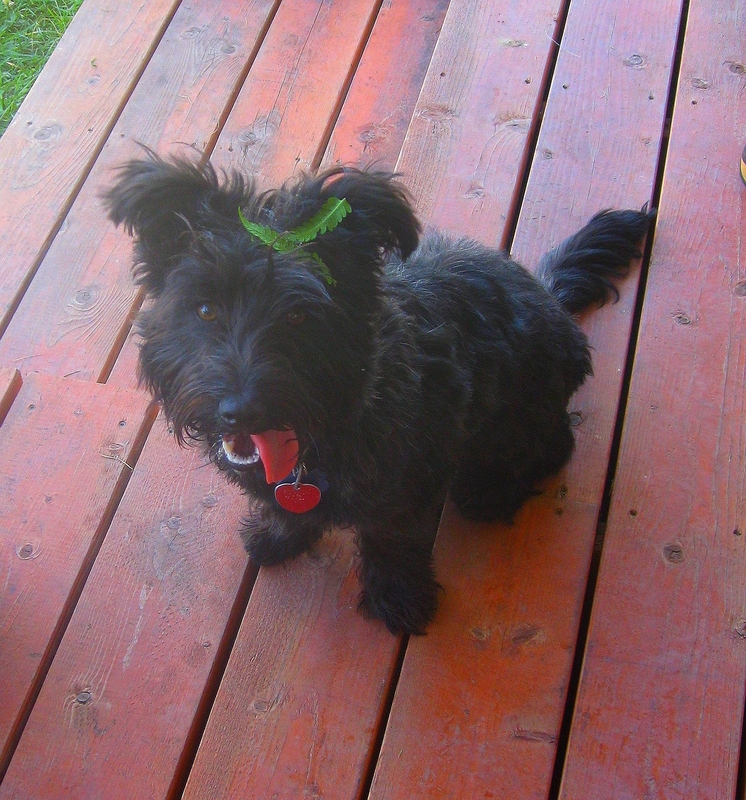 But Kenzie, an energetic Scottie-mix, took one look at me sitting on a bench, jumped into my lap and gave me a no-nonsense look that said: I’m going home with you. And so she did. On the ride back from the shelter, I decided she didn’t look like a Kenzie, so I started thinking out loud about other possible names. When I said Pepper, she gave a little joyful yowl, which I interpreted as Yes! That’s my name! From that minute onward, for the next seven years, until this past Wednesday, we were rarely apart. She loved other people and dogs with enthusiasm, but made it clear that she never wanted to be out of my sight. She was a barker when she played and chased other dogs, or when anyone came to visit. I called her my loud-mouth Texan, a trait she and I shared when excited. My son-in-law, Joe, whom she twisted around her little paw, called her the Queen Bee because she bossed the family’s two, much-larger, male dogs around after their Great Dane alpha female went over the Rainbow Bridge. The nickname stuck here at my apartment complex. One dog-owning neighbor called her the social director because of the way she got all the dogs up and running around in the dog park. 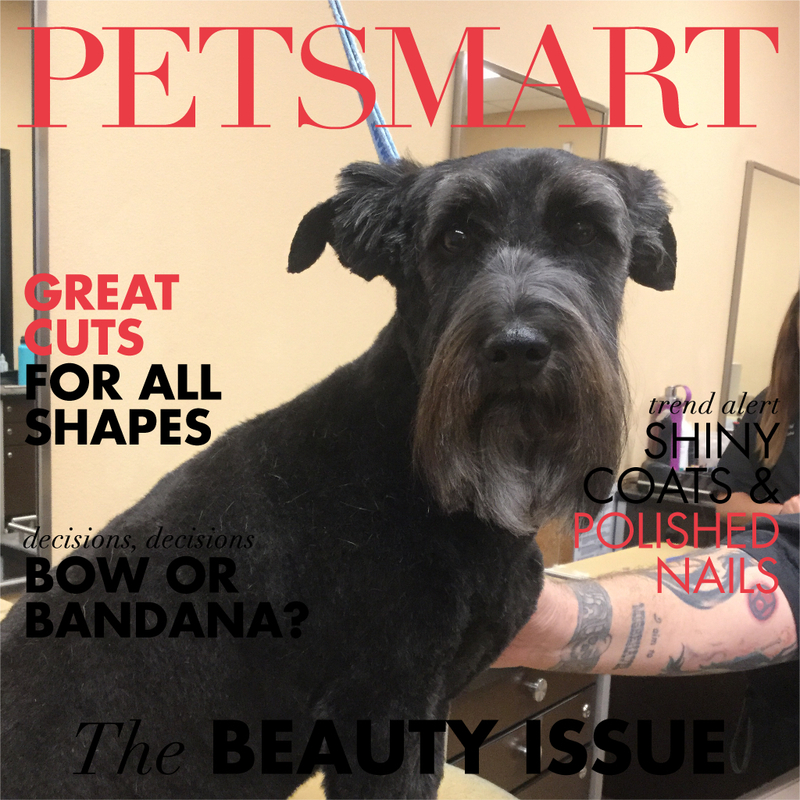 Pepper made the cover of PetSmart’s magazine after one of her recent every 10-week groomings. But because I was not in her sight, she was an unhappy dog, easy to see by the down-turned ears. She would cry like a baby when I left her for her bath and hair cut. Pepper loved belly rubs, and in no uncertain terms would let all humans she came into contact with know she wanted one. She also had this unbelievable stare when she wanted something, clearly expecting you to know if that something was a treat, a walk or just attention. 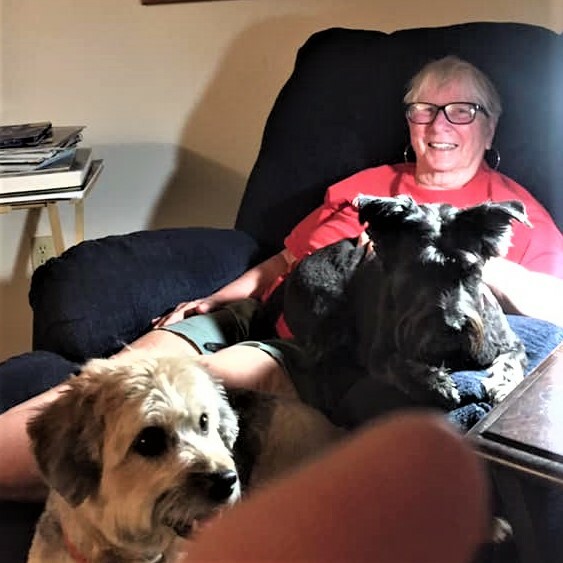 Every weekday morning, Jean would drop Dusty off at my apartment, where the two dogs eagerly greeted each other, then spent the day playing, begging for treats, walking together, or simply curled up with each other behind my recliner, a place that they allowed no visiting dogs to enter. Me, Pepper and Dusty in my recliner. The two dogs were besties, and now Dusty wants to know where her friend is — in doggie heaven I tell her. Pepper’s barking was her most annoying trait. Sort of funny, but it’s now what I miss most about her. I also miss her stare, our early morning bed cuddles, and her simply joy of life. OK, I miss everything about Pepper. I suspect it will be many days yet before I make it through a 24-hour period without tears. But I wouldn’t take back a single one of those tears in exchange for not having the seven treasured years Pepper and I had together. She had more enthusiasm for life in her little body than anyone I have ever met. And if there is a doggie heaven, which I believe in more than I do in a heaven for humans, she’s sharing it with all the other dogs who once were loved by a human as much as I loved Pepper. I’ll never stop loving or missing Pepper. But in the meantime, perhaps there is another dog out there who needs rescuing, and needs me as much as I need her. I’m a glutton for joy, even if it ends in sadness. Beautiful tribute to such a happy dog. Thanks Kim. It helped writing it. I am sorry for your loss, but happy you had each other. Someday you will be able to look back at what you’ve just written about Pepper without tears, maybe not soon, but you will be glad that you wrote it. I am. Rest in peace little Pepper. Thanks hootiebird. I am already glad I wrote it, even though I cried wrile doing so. Pat, I am sending love and understanding as I have been in that same place far too many times. ❤️❤️❤️ Lindy in Lake Ann, MI. Thanks Lindy. Pepper’s not the first dog or cat I’ve lost either. I still remember, love and miss them all. What a wonderful tribute to Pepper. It makes me cry with you. I’m so deeply sorry for your loss. But we’ll her in our hearts. I didn’t know your Pepper but you sure let me know her here, thank you. The loss of a good dog lingers and you’re right, you’ll never stop loving or missing her. I’m so sorry, Pat. What a sweet little girl. Seven is just not old enough but it’s never long enough no matter how old they are. I hope she sends another pup your way very soon. What a joyous and sweet evocation of Pepper, and her special bond with you. I am sorry she headed on so soon. I’m sending hugs and hoping that just the right pup comes along whenever you are ready! Pat, thank you. You’ve said so beautifully what we all know: that our dear animal companions can’t be with us long enough, but they fill every moment of that too-brief time with a joyful energy that boosts our spirits and enlivens our days. I’m glad to know that you are already looking for that next loving companion–who, I am sure, is already looking for you. Oh! What a wonderful tribute So sorry for your loss but happy that your doggy had a wonderful life – what a beautiful girl! Lovely memories, Pat. So glad you had her and that you’re already looking forward to rescuing another pet. You have touched my heart, and I suspect, the hearts of pet lovers everywhere. Warm hugs of sympathy from me to you! I am so sorry to read of the passing of your dear little dog Pepper. She was so lucky to have chosen you and I hope the joy and happiness Pepper brought to you throughout seven very happy years, will help you through this difficult time. We, I am including Romeo, are both saddened by your losing Pepper. What a beautiful tribute both to Dog and Master alike. I know how much joy Pepper brought to your life and remember the day you first brought him to us! So now, in Doggie Heaven, he can meet up with Maggie and have a high ole time!